On our way to Puerto Natales we really enjoyed the view. We were now close to the small town and we could see the first houses and the sea. In the background, another mountain with a white peak. The land and the water had been playing with the human perception about space. We were confused seeing stripes of land diving into the sea – or was it the sea climbing onto the land? It was summertime and nature was blooming yellow and purple and we couldn’t get enough of these spectacular colors everywhere around us. 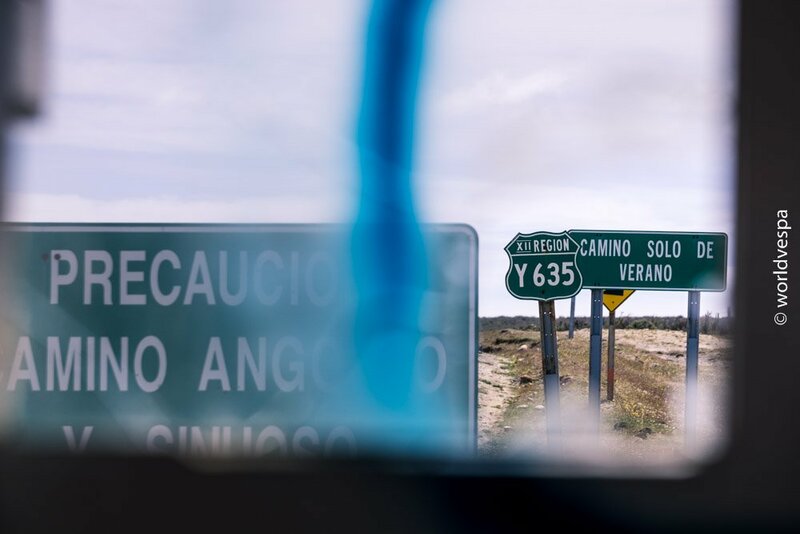 We read the road signs giving a dramatic tone to the scenery: “the road to the end of the world” (Ruta del Fin del Mundo) – Well, if this is the end of the world, then I like it! 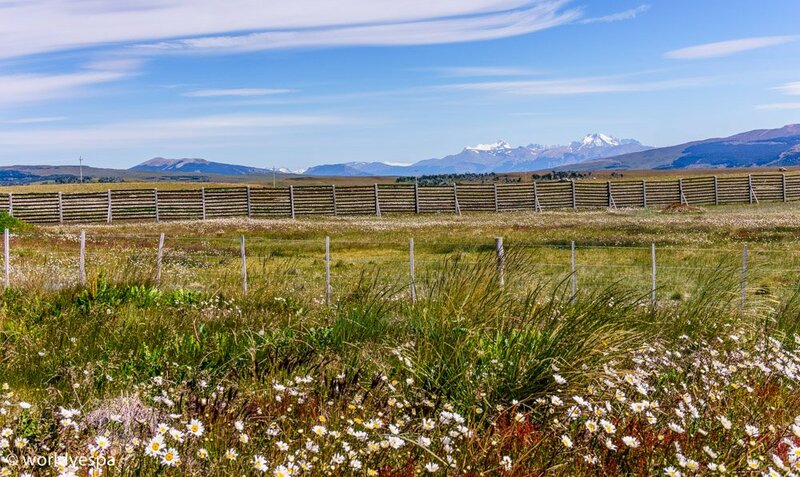 20,000 people live in Puerto Natales, which was founded in 1911 and used to be a commercial port for the livestock farming industry of the area. Its population consists of European migrants and Chileans from the island of Chiloe who came and gave the place an interesting identity. The colorful wooden houses with the small windows decorated with embroidered curtains were charming! 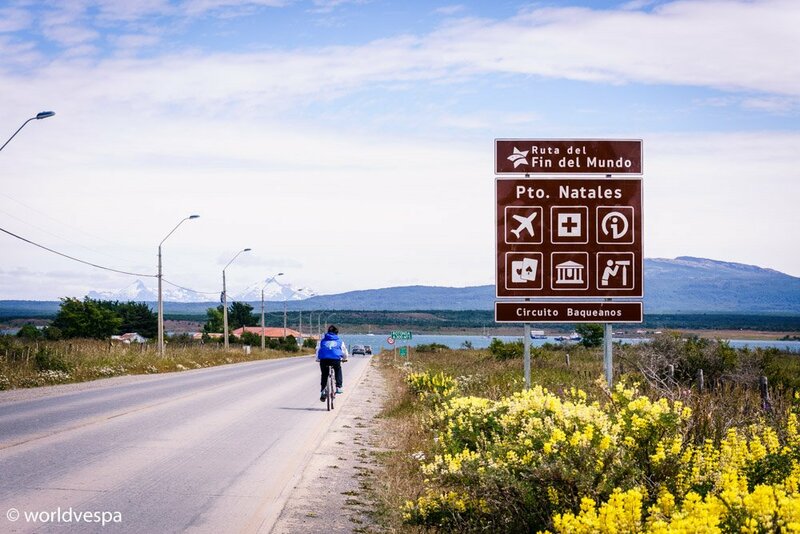 Nowadays, the economy of Puerto Natales relies on tourism. The town is near the main entrance to the Torres del Paine National Park and thousands of people use its facilities (accommodation, restaurants etc) coming either from the South or the North to visit the famous park. We could see all the hostels, hotels, b&bs, bars, restaurants…But we couldn’t spot any campsite in the town. We even managed to get lost in its streets and asked various people for directions. Finally, someone sent us to a small b&b whose owner used to rent space in the garden to pitch a tent. Stergios went inside to ask and almost immediately came out again looking furious. The “garden” proved to be a cement backyard for hanging the laundry and there were already 6 tents packed inside, the one next to the other with terrible bathroom facilities and a magnificent view to the 3m fence. It was a bargain! Only 7.5€ per person for this luxury! From the port of Punta Arenas we took the boat to Porvenir, a small village on the western part of the island of Tierra del Fuego. This boat was also Greek, but this time we weren’t that surprised. 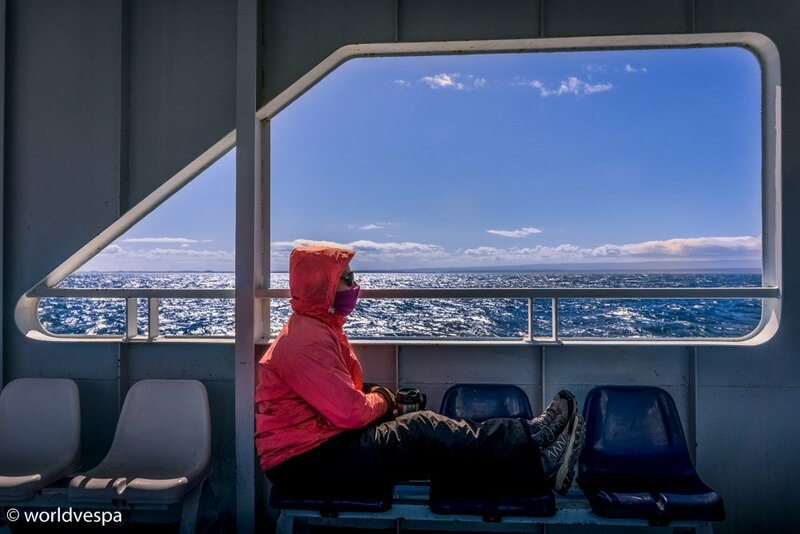 Our first concern was to find a place to sit in the boat’s closed space but it was very small and crowded, so we had to spend the 2-hour trip across the Strait of Magellan, outside in the cold. The wind was so freezing like if all the cold from the Antarctic were coming towards us. 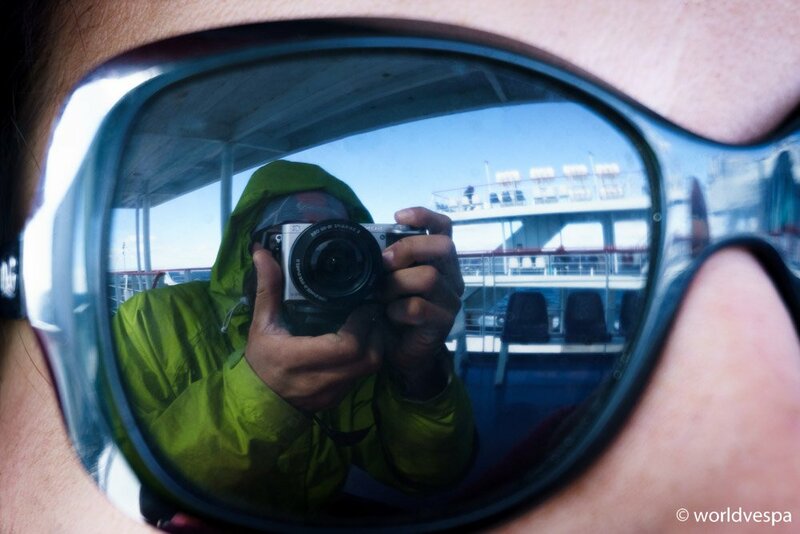 We were following the sun and trying to stay protected from the wind, but it wasn’t very easy. The boat was filled with travelers from all around the world and apart from the motorcyclists who were quite many, we met a German couple traveling by bicycles. What really surprised us was that they weren’t alone, they had their baby with them who was only 2 months old! They had a trailer attached to the bicycle perfectly protected from the cold and the rain and the baby seemed happy and relaxed. Who said that once you have kids you should stay at home?! Who said that once you have kids you should stay at home?! We didn’t stay at Porvenir, we immediately continued towards Rio Grande, the city where we had planned to spend the night. 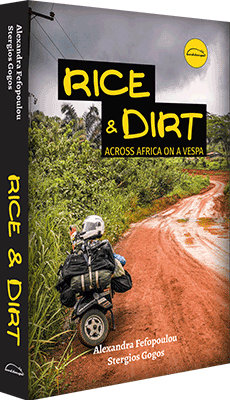 We were traveling on dirt road, but it was good quality and without the slightest problem. Even the wind was blowing towards our direction and probably at the same speed with us, so we hadn’t realized how strong it was until we got off the scooter. After 240kms, we finally arrived frozen enough at Rio Grande. 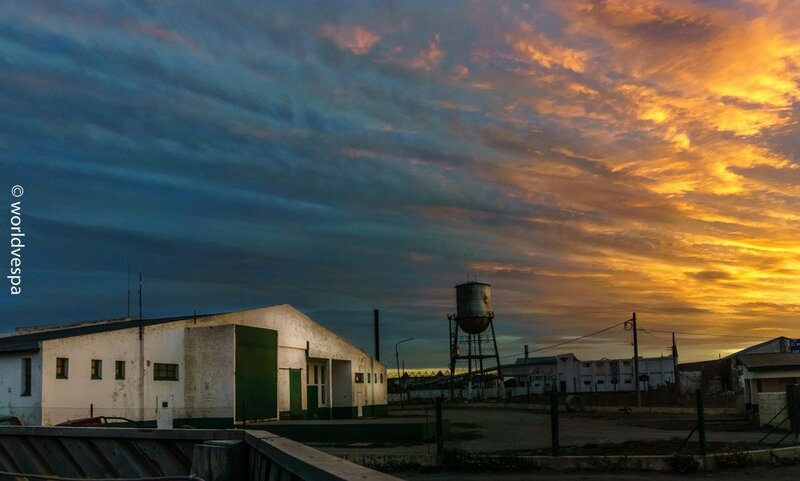 There was nothing special for travelers to see in Rio Grande, which is part of an industrial area. Although the city is larger than Ushuaia, only people who didn’t have other option, stayed there. There was no campsite, so we found the cheapest hostel and reluctantly agreed to stay. Luckily, while I was waiting outside the supermarket for Stergios to do the shopping, a smiling woman around 50-55, approached. I was tired but decided to smile back, but my face lit up when I heard her asking: “Are you looking for a campsite?”. “Oh, yes!”, I answered and from that moment, a series of events led to a true friendship! Only some days ago, Graciela had started running a campsite in the garden of her house. “La Casa Azul de Graciela” – Graciela’s Blue House, was a small heaven for travelers who prefer the tent but also need the warm environment of a place to spend some relaxing hours. Everyday at about 17:00, the time when travelers usually start looking for a place to stay, Graciela was going to the city center to find those people. 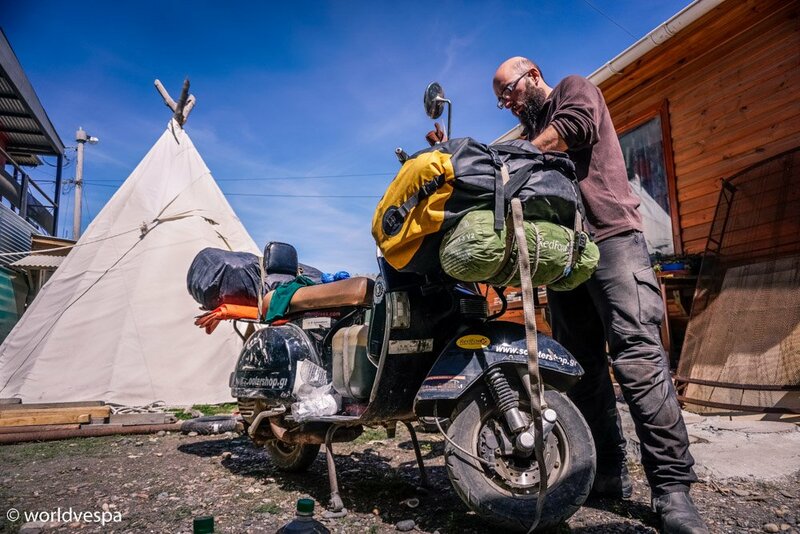 She preferred to accommodate backpackers and motorcycle/bicycle riders and when we got there and she saw how tired we were, she offered us the big teepee she had, so we could sleep immediately. 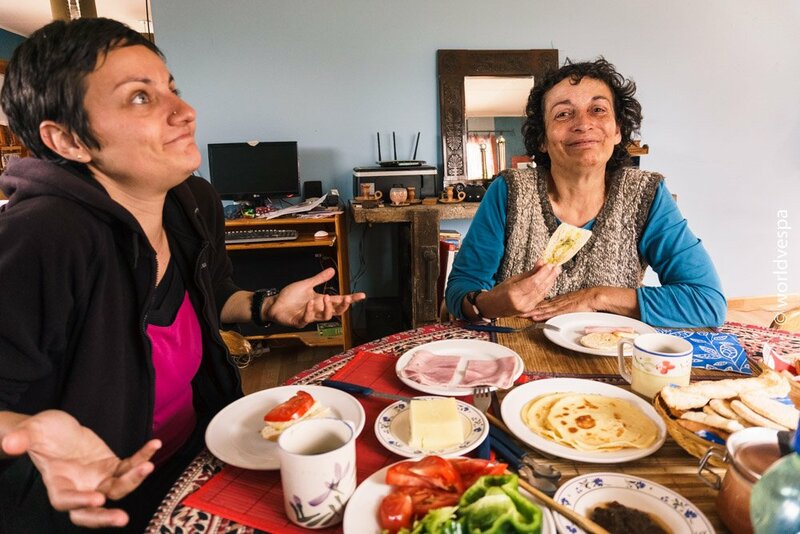 Her kitchen and living-room were available to her guests and her heart was wide-open! We felt so warm and cozy, that we soon changed our plans for Ushuaia. While in Rio Grande, Stergios and I, had to make some hard decisions. We knew that there was no much money left in our pockets, so we had to come up with a new plan of how to continue. We hated to admit it but there was a possibility that we’d need to go back to Greece for some time. We had been cautiously avoiding to bring this topic up, but we had to confront it. Our time with Graciela helped us relax and make our decisions. After 3 days at the Blue House, we took off for Ushuaia, the city commonly regarded as the southernmost city in the world. The “southernmost city in the world” is mainly a slogan used for tourism to attract visitors as well as the tourists headed for Antarctica. 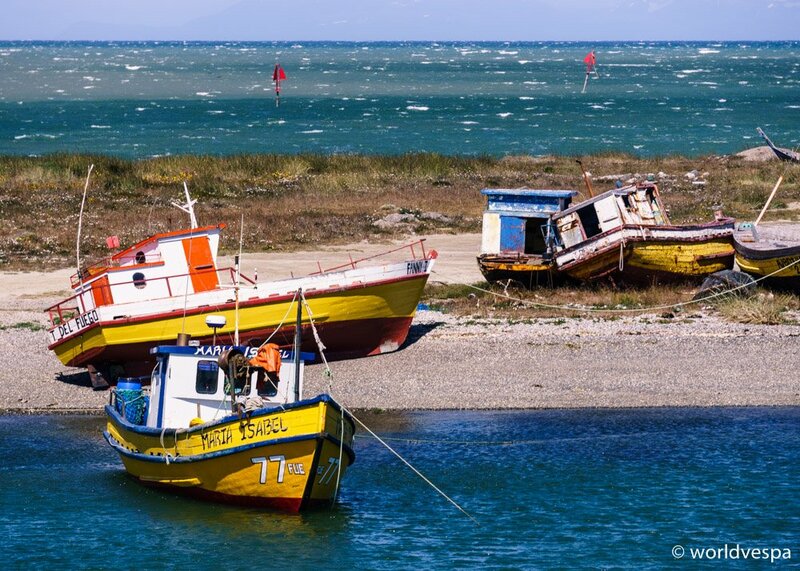 Currently three cities or towns use this slogan: Ushuaia in Argentina as well as Punta Arenas and Puerto Williams in Chile, with the latter being the absolute southernmost city by latitude. 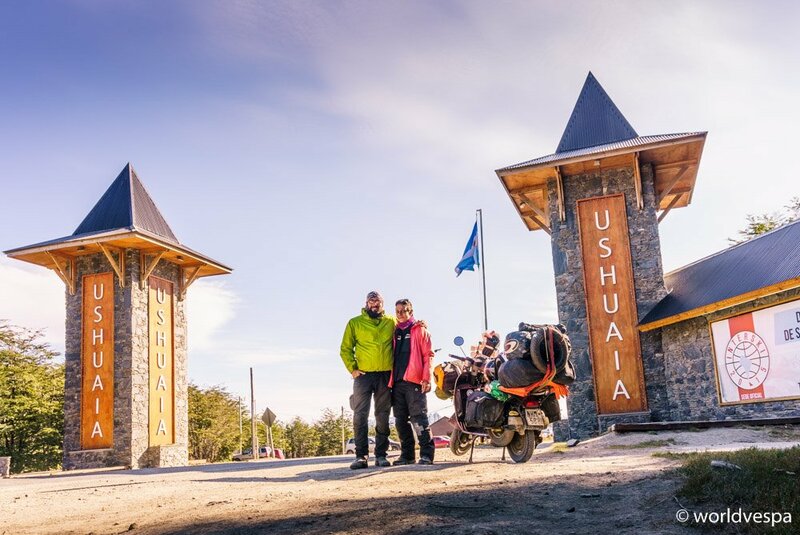 The reason we wanted to reach Ushuaia was mainly symbolic, since it’s the end or the beginning of many journeys. However, ours doesn’t have an ending, so let’s call it an OCD and take the famous picture! We left from Graciela’s with the promise to return soon. I was thinking in 2-3 days, but while we were about to go, Stergios whispered to Graciela: “See you tomorrow!”. I didn’t believe him. We took Ruta 3, the main road that connects Buenos Aires with Ushuaia which is only 210kms from Rio Grande. Due to the climate of the area, we drove through subpolar evergreen forests, with lakes, currents and rivers cutting through the big trees that were perfectly adapted to the harsh weather conditions. We also saw the complex construction of beavers’ nests (we later learned that beavers are not an indigenous species and they have caused problems to the area) and other interesting things we had only seen in documentaries. However, enjoying the view wasn’t very easy. It was the peak season for tourists and there was traffic on the road. Campers, trucks, cars, motorcycles…All types of vehicles were moving from/towards Ushuaia and, as not all drivers are respectful, the trip to Ushuaia wasn’t relaxing at all. We were a bit tired from all the touristy areas we had been to lately, but we couldn’t imagine that this could ruin our mood. When we arrived at the city, we fell into heavy traffic! Unfortunately, filtering was not an option because the Vespa with all the luggage was unable to move between the lanes, so we had to wait patiently in line. We managed to find the gas station on the coastal road and we had another queue in front of us until the fuel pump. Many of the people in line came to see our poor Kitsos and chatter with us, but we could barely smile. With our tank full, we headed to the famous wooden sign to take a picture. We took the picture and ran before another group of tourists came to see the Vespa – and maybe us. The big question of the next morning was: Would we go until the end of Ruta 3, at Bahia Lapataia which was 14kms from where we were? There is one more famous sign there and everyone takes a picture, but it was inside the National Park of Tierra del Fuego (Parque Nacional Tierra del Fuego). The entrance fee was around 12€ per person and since we only wanted to get in, take a picture and go, we concluded that it was better not to spend this money. The decision wasn’t very hard to make. We would turn back to Rio Grande immediately. 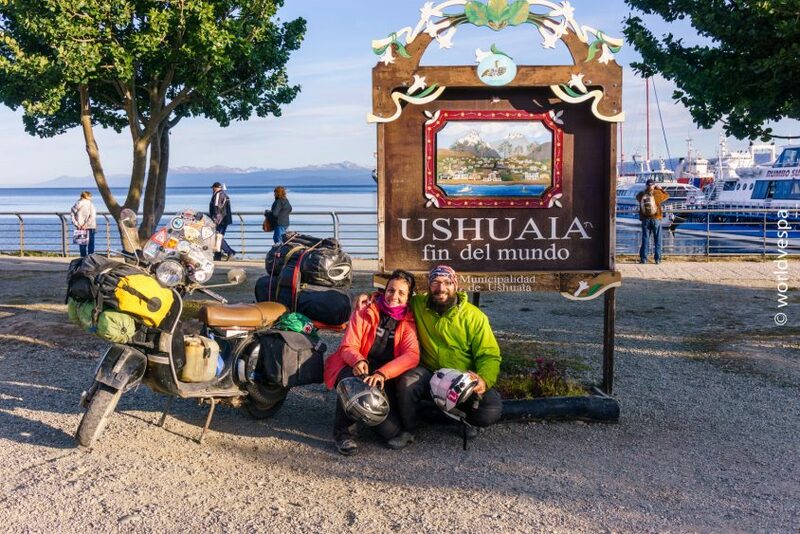 Someone somewhere, had told us that Ushuaia is mockingly referred to as “Culo del Mundo” (Arse of the World), paraphrasing the “Fin del Mundo” (End of the World). With this in mind, we left with no looking back. When we got to Rio Grande we followed almost the same steps as we had done the last time we were there: We arrived tired, we went to the supermarket and we met Graciela at the same place walking at the main street. This time I first spotted her and ran towards her. She told me with her warm voice: “I had been waiting for you!”. We stayed with her more than one week and we learned so many things about the history of the region. She really cared about her city and its people and she gave us the chance to take a close look at one of the many faces of Argentina that everyone tries to keep hidden. The Blue House is at the side of Rio Grande where no one wants to be. Just behind the first row of houses facing the riverfront, there are the settlements of the underprivileged. These people are mainly Argentinian migrants from other parts of the country, who came in search of work in the industrial zone of Tierra del Fuego during the crisis of 2001. Even until today, there is no sewer system, no running water or electricity in many cases and people struggle with high unemployment rate. They live under highly unhygienic conditions since their settlement is built on top of an old landfill. Graciela told us about the other face of Ushuaia, too. She explained that everywhere in the forest around the outskirts of the city, there are people who live in shacks and their population is not registered in the archives of the Province. There are people living and working for the thousands of tourists but officially, they do not exist! Graciela had been working for the last years documenting these people in Rio Grande and in Ushuaia, in order to improve their quality of life. She even took us for a ride to see for ourselves and showed us documentaries on the subject. Everyone loved her and greeted her with warmth! The money we paid for accommodation at Graciela’s was nothing in comparison to what she gave us back. The long talks about travels and life, the Greek and Argentinian cuisine sessions, the red wine, the laughter. How could we leave that place? We couldn’t get enough of the view to the river, watching the tide and at the background, the C.A.P. (Corporación Argentina de Productores) the first company to export the products of Tierra del Fuego – symbol of prosperity during the 20th century and sadly abandoned today. Before we leave, we even had an “asado fueguino”, barbeque with lamb from the area, which according to Graciela, is the best lamb meat and the backbone of the local economy. I rode from Punta Arenas to Puerto Montt last year on a moto. It was wonderful. But we went a little faster. 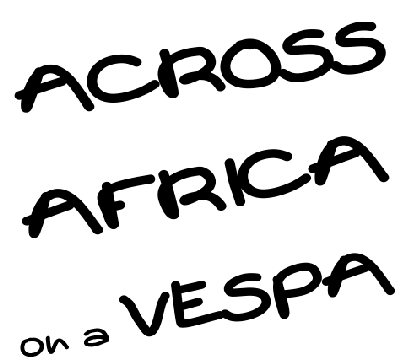 Riding on a Vespa must be more fun as you get time to see the sites, but not as slow as a bicycle. And as much work. This route is wonderful indeed! And you’re right that we get the time to see the sites. We’re traveling with no more than 70 kilometres per hour. And on roads like the Carrera Austral most of the time we’re going on 20-30 kph. Anyway, all means of travel are great as long as you enjoy them!